There are numerous opportunities for travel and research collaboration between Europe and Japan. Until 2015, we highlighted each month around 30 to 50 schemes to support researcher collaboration, exchange, or mobility in our monthly Newsletter. The relationship between the EU and Japan is increasingly close and diversified. Various cooperation agreements have been concluded since 1988, at both bilateral and multilateral level. An overarching Science and Technology Cooperation Agreement was signed in 2009 and came into force on 20 March 2011. This agreement pledged to encourage, develop and facilitate cooperative activities. To that end, it also established a Joint Committee on Scientific and Technological Cooperation, to exchange information and views on Science and Technology policy issues, identify priority areas for cooperation and promote reciprocal access to research and innovation programmes. This committee meets at least once every two years. It first met in Tokyo in June 2011, with the second meeting taking place in June, 2013. The Third such meeting took place in Brussels in May, 2015. At this meeting agreement was made on a "Joint Vision" towards a closer relationship in research and innovation. The importance of close and friendly relations in science, technology and innovation has been recognised by the leaders of Japan and the EU, who have expressed commitment to unlocking the full potential of cooperation (21st EU-Japan Summit Joint Statement, art.17) . Later statements reiterated this commitment 22nd EU-Japan Summit Joint Statement, art.14 and 23rd EU-Japan Summit Joint Statement, art.22. On 29 May 2015, during the 23rd EU-Japan Summit, the leaders endorsed a New strategic partnership in Research and Innovation between the European Commission and the Government of Japan. Through the regular Horizon 2020 calls for proposals, where Japanese participants can join projects in any area. Through "coordinated" or "joint" calls for proposals issued by the EU and counterpart ministries and agencies. Here, each side makes available an equal amount of funding to support their researchers in joint projects in areas of common interest. In recent years such calls have been issued in photovoltaics, superconductivity, aeronautics, critical raw materials, and Information and Communication Technology (ICT). Individual researchers can take part in mobility programmes under the Marie Sklodowska-Curie Actions scheme (MSCA). Japanese researchers may also apply for the European Research Council (ERC) grants, which are for the most ambitious and highest quality researchers. The EU and Japan also work together in multilateral schemes. One such example is the International Thermonuclear Experimental Reactor ITER. This is a large-scale scientific experiment to demonstrate the technological and scientific feasibility of fusion energy using a 'Tokamak' machine. Other multilateral cooperative projects include the "Human Frontier Science Programme". The EU and Japan have a successful track record of collaboration, but a lot more can be done to further build and strengthen our research relations. 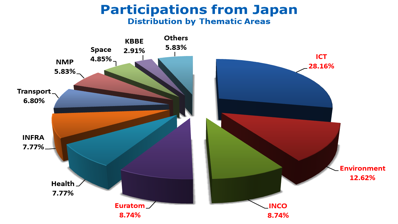 In the 7th Framework Programme (FP7), there were over 100 Japanese participations in cooperative research projects, in a broad range of areas, as it can be seen in a figure below. Japanese researchers have also participated in mobility programmes funded under the Marie-Curie actions of FP7 as well in ERC grants. This trend continues under Horizon 2020. Priority areas for future cooperation with Japan include critical raw materials, transport research including aviation, nanotechnology, health, sustainable food security, ICT, and there is also the potential to do more together in renewable energies, ocean research and robotics. We also work together in a number of other areas, including energy (non-nuclear), nuclear safety, space research, security research and Euratom. See here for more details on areas where Japanese participation is particularly welcomed. Examples of EU-Japan joint research projects. Japan is mentioned in a number of calls in the Horizon 2020 Work Programme 2016-2017. Apart from the joint calls, there are also a number of regular Horizon 2020 calls in which a Japanese partner will receive funding: see below for details. Remember: Japanese institutions can also participate to any of the other Horizon 2020 calls, provided they have matching funds of their own. For further information on Horizon 2020 and Japan, please visit the pages of the Delegation of the European Union to Japan and of JEUPISTE. More info for Japanese applicants on the page of MIC and NICT. The 3rd EU-Japan Joint S&T Committee meeting in May 2015 endorsed a co-funding scheme developed by JST in close cooperation with the EC. This scheme has the intention to support EU-Japan collaboration in research and innovation, and to provide funding to successful Japanese participants in open calls for proposals in Horizon 2020. In these topics, Japanese participants may apply for funding from JST. JST will carry out its own evaluation of Japanese applicants prior to that on the EC side. The EC-JST co-funding scheme is one of the support schemes put in place by EU international partner countries to enable a stronger and more balanced collaboration between their universities, research institutes and enterprises with European ones under Horizon 2020. This mechanism is not for Horizon 2020 projects, but is specifically targeted towards cooperation for projects between Japan and several European countries (target countries in Europe are France, Germany, Spain and Turkey). EIG CONCERT-Japan has launched their 3rd Call, this time on Food Crops and Biomass Production Technologies on 10 February 2016. The deadline is Thursday 28 April 2016. EIG CONCERT-Japan is an international joint initiative to support and enhance science, technology and innovation cooperation between European countries and Japan. CONCERT-Japan began as an ERA-NET project funded by the 7th EU Framework Program for Research and Technological Development (FP7) from 2011 to 2014. It is now in its second phase, as an independent activity of the European Interest Group (EIG) for Japan.